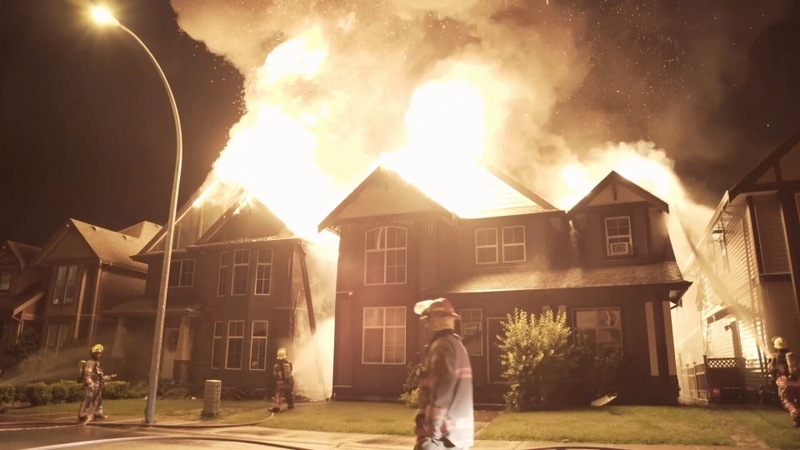 At least six families made it out of multiple burning buildings with their lives after a huge fire tore through Chilliwack’s Sardis neighbourhood overnight. Three vehicles’ gas tanks exploded, three homes and two garages were levelled and almost a dozen more structures were threatened along Safflower Crescent. And neighbours who woke up to the carnage first were instrumental in saving lives, say friends of the survivors. “They got a knock on their door at three in the morning and ran,” said Sherri Proudfoot, a friend of Rachel Perigny, whose partner and two children escaped with their Labrador. Thee family lived in the top suite of a multiple suite property. Both the front house and the carriage house were gutted, and with that went their clothes and kids’ toys, she said. Perigny herself thanked the quick work of the Chilliwack Fire Department, which prevented the giant blaze from spreading even further and destroying more homes. “Thank you to the first responders who did such an incredible job getting the fire under control so quickly and to our life saving neighbours who pounded on our door at 3am and saved us from what could have been a much more tragic end,” said Perigny in a Facebook post. Police are now investigating the fast-spreading fire, but haven’t declared it suspicious. Several of the people who had escaped the fires were giving statements about what happened to them today. Though residents managed to flee to safety, neighbours said there were some tense moments overnight. Daniel Turcotte said someone was running door to door screaming, "Fire, fire, fire." "We got up and looked to our bedroom window and the flame was 50 feet in the air," Turcotte said. Turcotte said his family tried to protect their front of their property by spraying it with a garden hose, but the heat was too intense. "If you look at the siding it's all burnt," he said. Now that everyone is OK, the next step is finding these people somewhere to live, said Proudfoot, who with the Evolutionz Dance studio has started to raise money. Friends have come together for a family of four who has lost nearly everything, hoping to fundraise enough to get Perigny and family a new start and a new place to live. “They are not going to have clothes so it’s just the necessities for now,” she said.